Live music, bold décor and a huge range of food and beverage options operating out of repurposed shipping containers and caravans add vibrancy to the area. Photo credit: DanielFoodDiary.com. Singapore halted demolition of an old industrial building within a high-tech business park and repurposed it into a vibrant start-up cluster. In the early 2000s, start-ups in Singapore faced a dearth of affordable spaces where they could work, exchange ideas and network. To address this gap, a government-led project began in 2011 to repurpose an old industrial block to give start-ups the space and the supportive ecosystem they needed for their budding ideas to take off. Aptly named LaunchPad, the start-up cluster was officially launched in 2015—and demand has been overwhelming. With no natural resources to rely on, Singapore has always stressed the importance of building up its human capital. While its education policy proved highly successful in the academic sense, there was worry among policymakers and business leaders that a rigid, structured education had led to the dearth of entrepreneurs in Singapore. In 2003, the Economic Review Committee recommended remaking Singapore into a creative and entrepreneurial nation. This led to the government aggressively promoting entrepreneurship through a host of pro-enterprise initiatives—from reducing regulatory red tape to awarding grants. Still, start-ups faced challenges, notably high rental costs. Entrepreneurs also reported a lack of common spaces to gather and share ideas, as well as a supportive ecosystem. In the late 2000s, entrepreneurs responded by setting up co-working spaces all over Singapore. These allowed start-ups to defray steep rents while meeting others working on their budding ideas. The idea of co-working began to catch on. In 2011, the Media Development Authority (MDA) heard that an old industrial building, Block 71 in the Ayer Rajah Industrial Estate, was slated for demolition. The landlord JTC Corporation (JTC), the lead government agency for Singapore’s industrial development, was planning to redevelop the land. MDA saw this as an opportunity to experiment: could it create a vibrant enclave of interactive digital media start-ups by offering affordable rent and opportunities to collaborate and receive incubation help? It convinced JTC of its vision and negotiated a master tenancy for three years. It then brought in investor SingTel Innov8 to help fund the initiative, and incubator NUS Enterprise to run the hub, which became known simply as "Block 71". JTC readily agreed to the repurposing of Block 71, recognising that there was a lack of central locations for start-ups to cluster for knowledge sharing, and to facilitate mentorship and funding. It also saw an opportunity to reuse the existing facility to address the demand of the emerging infocomm sector quickly. Without the cost of constructing a new building, JTC would be able to offer more affordable rental to its tenants. Repurposing works began with the upgrading of basic facilities such as the toilets, car park and lobby spaces, and the setting up of wireless Internet access. Besides the infrastructure, the founding partners also launched a community space called Plug-in@Blk71. It served as the nucleus of the community, seeding and aggregating the start-up ecosystem at Block 71. Entrepreneurship support activities such as events, sharing sessions, investor days and hackathons were organised to catalyse the development of the enclave. The block filled quickly, as entrepreneurs were drawn by the affordable rent (which was closer to industrial flatted factory rates and much lower than prime office rates) and the many networking and mentoring opportunities. By 2013, there were some 100 tech start-ups in Block 71, forming a vibrant community that became the talk of the entrepreneurial community. Block 71’s location was also attractive. It was inside one-north, a high-tech business park where research scientists and investors worked, as well as a stone’s throw from higher learning institutes that start-ups could tap for talent, expertise, knowledge and resources. With the pilot a success, JTC and SPRING Singapore, a public agency charged with helping local enterprises grow, expanded the start-up cluster by building Block 73, and refurbishing the existing Block 79. The three blocks—71, 73 and 79—were collectively named JTC LaunchPad@one-north and officially opened in 2015. To create more opportunities for tenants to meet and exchange ideas through chance encounters, JTC built more shared amenities at LaunchPad, including a central meeting room that doubled as an event hall, and sports facilities. At the same time, the landlord rebuilt an old food centre and approached the Timbre Group, a company that ran music festivals and live music restaurants, to set up a dining venue with a new concept that would add vibrancy to LaunchPad. 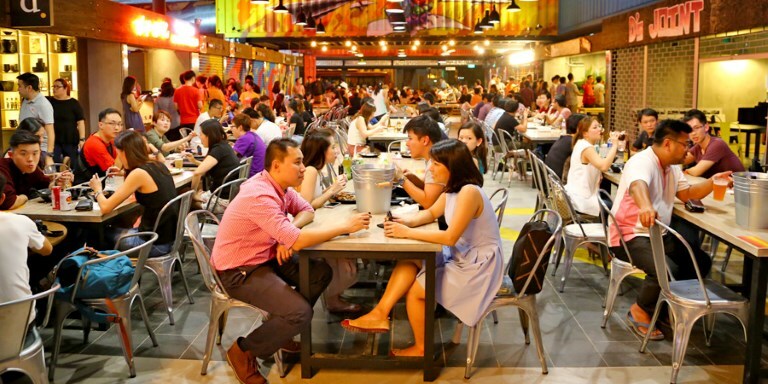 Dubbed a "gastropark", the food hub opened in 2016 as Timbre+. The sprawling space, with its industrial chic décor, bold street art and live music, offers the working population and nearby varsity crowd a place to unwind and network after office hours. In line with its support for start-ups, JTC created two incubator units at the gastropark for first-time chefs or F&B entrepreneurs. The aim was to let them learn the tricks of the trade alongside F&B veterans. SPRING also roped in the Action Community for Entrepreneurship (ACE), a not-for-profit incubator, to build the LaunchPad community by organising social and entrepreneurship events and encouraging members to participate. On top of this, ACE operates a Welcome Centre at Block 79, where it provides a one-stop service to help new entrepreneurs get their ideas off the ground. Networking sessions are part of the programming at LaunchPad@one-north. Photo credit: NUS Enterprise. JTC LaunchPad@one-north has been a highly sought-after location. At the time of its official launch in January 2015, it was already 90% occupied, housing mostly start-ups from the science and engineering, biomedical, electronics, infocomm and media sectors. The success of Block 71 led NUS Enterprise, Singtel Innov8 and Infocomm Investments (a wholly-owned investment arm of the Infocomm Development Authority) to build a similar entrepreneurship centre in San Francisco, called Block71SF. Opened in 2015, Block71SF aims to help Singaporean start-ups break into the Silicon Valley tech start-up ecosystem. The co-working spaces—open to start-ups from Singapore, Southeast Asia and the United States—and tech events like pitching sessions and hackathons, encourage typically isolated entrepreneurs to network, collaborate and inspire one another. Back in Singapore, JTC continued to expand JTC LaunchPad@one-north. Three new blocks—75, 77 and 81—were completed by early 2017. As of March 2017, LaunchPad had a community of more than 800 start-ups and close to 50 incubators. In support of start-up growth in Singapore, JTC has also brought the LaunchPad concept to the Jurong Innovation District (JID), envisioned as the industrial park of the future. Called JTC LaunchPad@JID, the new cluster will house advanced manufacturing, clean-tech and engineering start-ups. Located next to the Nanyang Technological University, LaunchPad start-ups there will have access to research experts and academia.